Architectural Leadwork is Australia’s leading supplier and installer of premium cast iron pipes. Cast iron pipes are proven to be durable, reliable and versatile. To its proven performance, cast iron continues to meet changing demand of modern industry. Our products are suitable for new build, replacement, restoration and conservation projects. We work with small, medium and large companies and have established strong relationships with clients in a wide range of sectors including building and construction and heritage restoration. Correctly installed cast iron pipe can last over 100 years with minimal maintenance required. Architectural Leadwork tender’s projects right across Sydney and regional NSW areas and is committed to serve both commercial and residential projects. We work with you directly to ensure your specific needs are planned and carried out with the utmost care and professionalism. At Architectural Leadwork, we pride ourselves on providing high quality workmanship and exceeding expectations of our clients. Eared Pipes, Plain Pipes, Access Pipes, Bends, Branches, Loose Sockets, Diverter Kit, Offsets 112.5°, Shoes, Ears, Holdfast, Pipe Bracket, Spacer Plate, Bobbins, Pipe Nails. Eared Pipes, Plain Pipes, Access Pipes, Bends, Branches, Loose Sockets, Connector, Plinth Offsets 135°, Offsets 112.5°, Shoes, Holderbat, Ears, Earbands. Eared Pipes, Plain Pipes, Access Pipes, Bends, Branches, Loose Sockets, Connector, Plinth Offsets 135°, Front Offsets 112.5°, Side Offsets 112.5°, Shoes, Holderbat, Ears, Earbands. 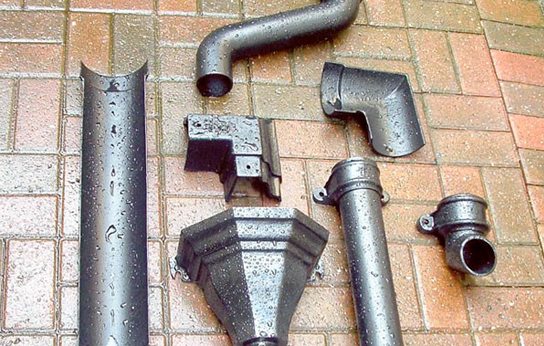 Our pipes, gutters and fittings come in a variety of designs, with ornamental finishes that add to the aesthetic appeal. We are also able to supply sundry items such as Gutter Bolt, Nut & Washers, Silicone Sealant, Gutter Fixing Screws, Bracket Screws and Touch Up Paint. We have assisted many organisations in supplying premium grade cast iron pipes, gutters, and cast irons products across Australia, we encourage you to get in touch with us to discuss your project and obtain pricing. Architectural Leadwork can deliver, arrange a courier, or alternately we will work with your courier provider to arrange delivery. For further information on the many cast iron products solutions we have available please contact us today for a quotation.